Young girls like chic colorful trendy design waxed chord cuff bangles bracelet decorated with turquoise & coral nuggets is perfect for birthday return gift teenage girls high school girls or for high school graduation gift. 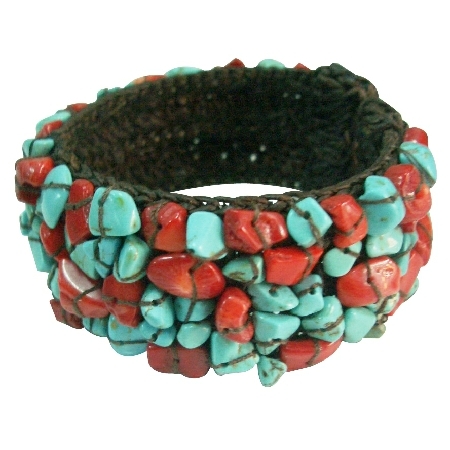 Buy Fun Wear Elegant stylish Gift Cuff Bracelet Turquoise & Coral Nuggets , sold & shipped by Fashion Jewelry For Everyone where you can shop online for Leading Online Retailer for Indian Fashion Jewelry. This Bracelets/Bangles collection has been tagged as Fun Bracelet,Elegant Bracelet,Gift Bracelet,Cuff Bracelet,Bracelet Gift,Bracelet Coral,Turquoise Bracelet,Turquoise Coral,Coral Bracelet,Coral Turquoise,Coral.